A Beta preview is available for the new Pending tab in the Overview Dashboard. 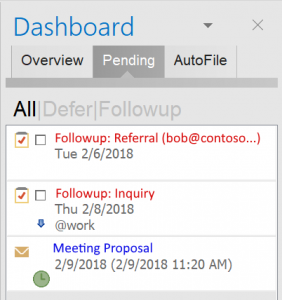 The Pending mode allows for the separation of tasks from the Dashboard that are actionable now versus ones that are awaiting some trigger in the future. This separation de-clutters the to-do list and focuses it more on things that can be worked on. In addition, the Pending list provides a place for Deferred messages to be monitored. Followup tasks have been relocated to the Pending area. If awaiting a specific response, the pending email contact is listed in the subject line as well. The task can be interacted with in the same way as the Overview tab by marking complete, double clicking to open, or right clicking for other actions. If the Followup is automatically cancelled due to a response, it will no longer appear here. Deferred messages that were snoozed and are awaiting return to the Inbox can now be viewed here. The date field shows the scheduled return date as well as the message received time. Previously, the only way to see the pending Deferred messages was to look through the Deferred message storage folders. Users who have opted in to the Beta update channel are being automatically updated to this beta preview. If you would like to try this preview, please go to your ClearContext Account screen in Outlook and enable the Beta tester updates. Then for an immediate update, select the check updates link in the ClearContext->About screen. We look forward for your feedback, and please feel free to comment below or directly to support.